Sarcomas affect hundreds of thousands of people around the world. Together we can make research happen! The Liddy Shriver Sarcoma Initiative is pleased to partner with Brandon's Defense Foundation to fund research on pediatric cancers. Brandon's Defense Foundation is a 501(c)(3) public charity that aims to increase the awareness of childhood cancer, to fund pediatric research and to provide resources for children with cancer. 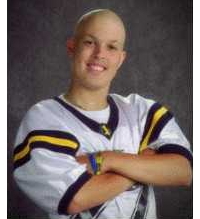 Brandon's Defense was established in May 2009 in honor of Brandon Gordon (Gordie #22) after a 731 day battle with osteosarcoma. Brandon often wondered where the gold ribbons were, why he never hear about "childhood cancer" in the media, and why the treatment protocol he was on was 30 years old. Finally, Brandon wondered why there were no more options for him to keep fighting. Even with countless tumors throughout his entire body and extremely difficult breathing, he still wanted to fight! A mission was developed based on what was important to Brandon and the many other children battling cancer, and "Brandon's Defense" will carry on the fight until there is a cure. There is no finish line until we find a cure!